Verizon has already announced the much-rumored BlackBerry Tour, but as of now, nobody knows (except for Big Red) exactly when the phone is to come out. We expect this to happen this summer and a previous rumor said it should be released sometime around July 13. 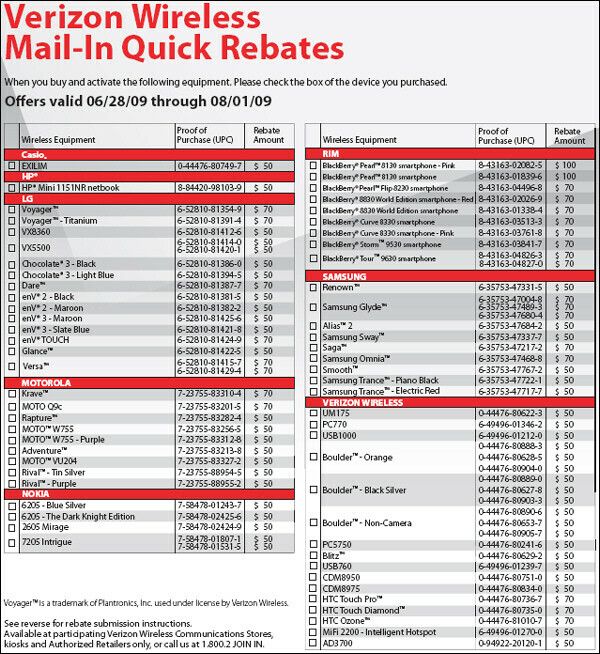 However, a Verizon rebate sheet that lists the Tour has been leaked that shows the smartphone will be offered with a $70 mail-in rebate. The more important detail is this particular sheet is valid from June 25 to August 1. We know this doesn´t indicate any specific date, but is at least a confirmation that we should expect it to ship soon, most probably at the end of July. Doesn't look like the Omnia II is on this list!! Bummer!!! Your not really excited about the Omnia are you? your username is rather funny. Yah! You really have no clue what your talking about do you? I hope the Tour OS runs smother/better than the Storm's. Don't get me wrong, I like my storm but I'm expecting more out of the Tour. BB pretty much always hits a homerun with their devices, which is why so many expectations were let down by sub-par software of the Storm. my never freezes like it use to... the only time i take the battery out is if like the app memory is below 10 or because i drop it and it flys out. The only advantage wifi has is the ability to circumvent international roaming charges. Otherwise VZW 3G is just as fast and even1x isn't terribly slow. Can someone explain for me? The rebate sheet still shows the 8130. But according to Verizon reps, the 8130 has been discontinued. Is it still available? Hey Fanman your right it was a funny screen name, and if people dont like blackberries well the choice is obvious, dont buy one. Wifi so what. A BB battery drains fast enough so why on earth do something to have it drain even faster? Agreed with VZW who needs wifi?, especially with 4g or lte hiting the street. I hope Verizon finally adds WiFi to their Blackberry's. Cell coverage at my house is limited and the only person able to make a call at my house consistently is a friend of mine with the Curve 8900 with WiFi calling from TMobile. I feel that most WiFi connections are a lot faster then any 3g coverage, but that's irrelevant to me. WiFi should be available for people living in area's with bad cell coverage. I did purchase a Verizon Network Extender which has been nothing but problems. Half the time it can't connect to Verizon's network and when it does connect my calls cut in and out, the Verizon network is probably overloaded. I'd think it was my Internet connection, but the VOIP that I had before and my friend's WiFi calling don't have the same issues. (I have a 20mb cable internet plan that clocks 12mb down / 4mb up, it should be able to handle a Network Extender.) Conclusion: Verizon should add Wifi to their Blackberry's. Turn off the WiFi on your phone if you want to save your battery, but Verizon should make it available for people who need/want it. It doesn't hurt Verizon, they require a data plan with a Blackberry anyway. A $70 rebate plus a $50 credit? It's gonna be awesome! !